Tina Turner’s Private Dancer blasts out of the stereo, taking me back to my childhood, when me and my sisters were subjected to Tina Turner on a daily basis. The sand is white and the sea as warm as bath water. 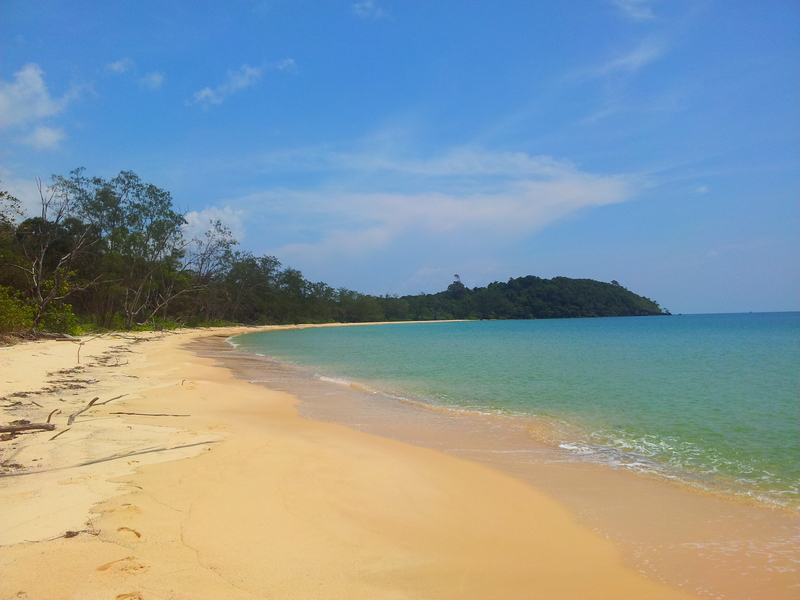 I’m on Otres beach, Sihanoukville’s more tame tourist spot. “Massage? Pedicure? Oh! Hair removal!! !” a woman says, pointing at my legs. Maybe I’m the first western woman that she’s ever seen who doesn’t remove the hair from their legs. I politely decline her offer. Five minutes later another woman approaches. “Bracelet? Oh! Hair!” she says, looking at my legs. For the next hour, more people approach me, all analysing my legs and deciding that I really need to remove my hairs. I think about discussing patriarchy, sexism, and the pressure that women are under to conform to a particular image of beauty. I want to tell them how unfair it all is. But then I realise that these women are just trying to make money, and it must be really frustrating for them to see the hairs on my legs and then not be allowed to do anything about it! There’s also children selling things. They’re cheeky and funny and when I last came to Cambodia, me and my friends bought lots of books off of them. This time, I’ve decided not to give the kids any money. Travelfish says why here and here. After the tenth woman comments on how hairy my legs are, I decide that Otres beach is not a good place to relax and do meditation! 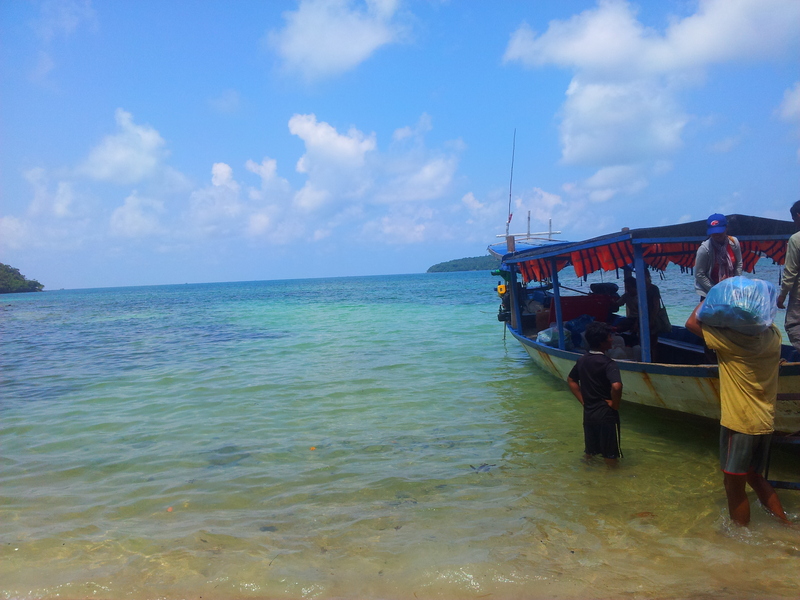 I take a boat to the relatively unknown island of Koh Ta Kiev. The total population on the whole island must be about twenty or thirty people – a fishing village which I don’t see, and a couple of beach hut-style guesthouses. I walk in the rainforest, all alone as beautiful massive wild hornbill birds fly overhead. The island is famous for its many species of birds. 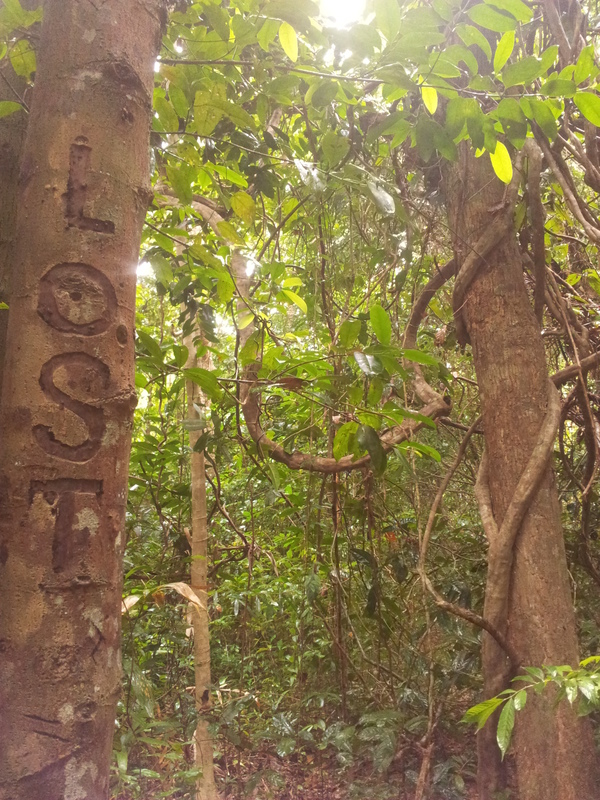 The trail is completely overgrown and l get lost. Afterwards I find out that nobody has walked on my route for months and months. 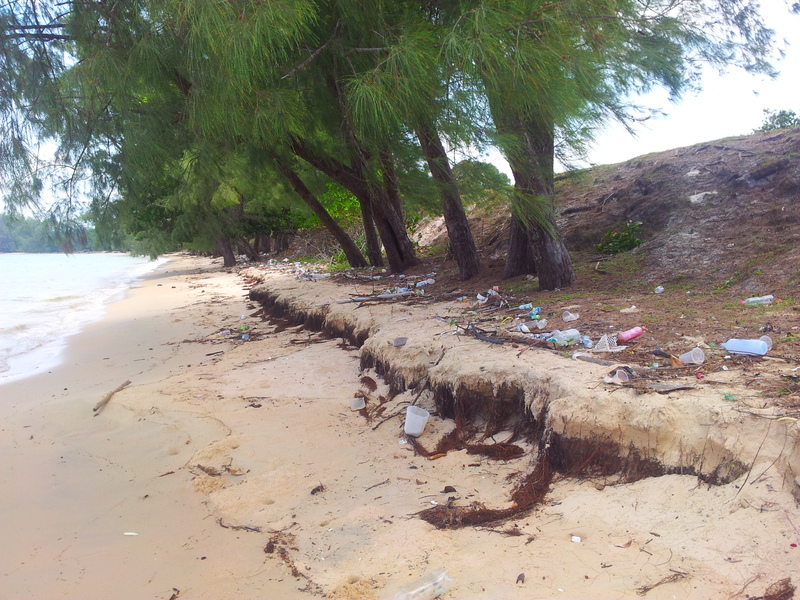 As with everywhere I visit, this untouched, perfect island is set to be destroyed. The Cambodian government has leased half of the island to a French company and half of the island to a Chinese company. 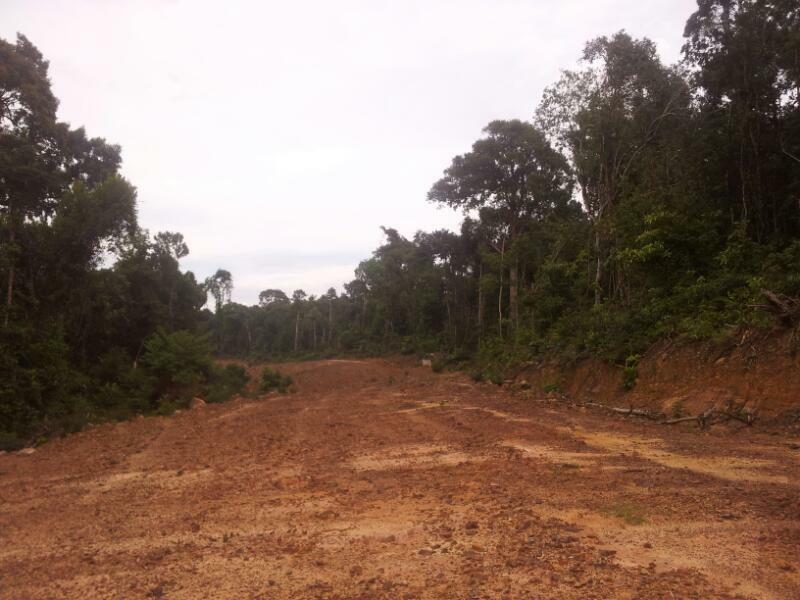 Whilst the French company has, so far, done nothing to ‘develop’ Koh Ta Kiev, the Chinese company has already chopped down and logged trees, and a huge, ugly road has been bulldozed through the forest. The company is called KSKW, and is owned by Ni Zhaoxing, President of China’s ZhongRong Group. They boast about their plans on their website. I’m told by locals that they plan to build a huge resort, with a golf course and casino for the rich. 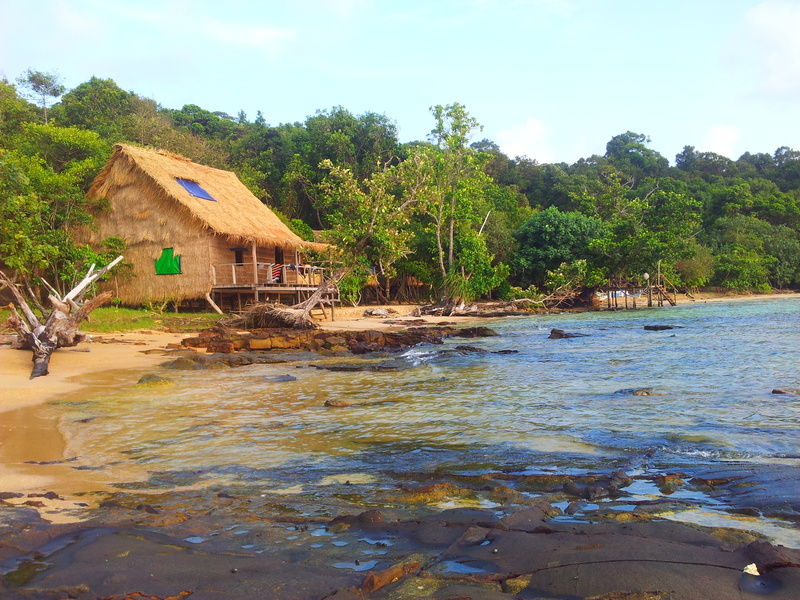 During my stay on the island, the company come to collect rent from the beach hut-style guest houses. It’s really sad to think of the destruction that is to come, and the inevitable death of the beautiful wildlife. 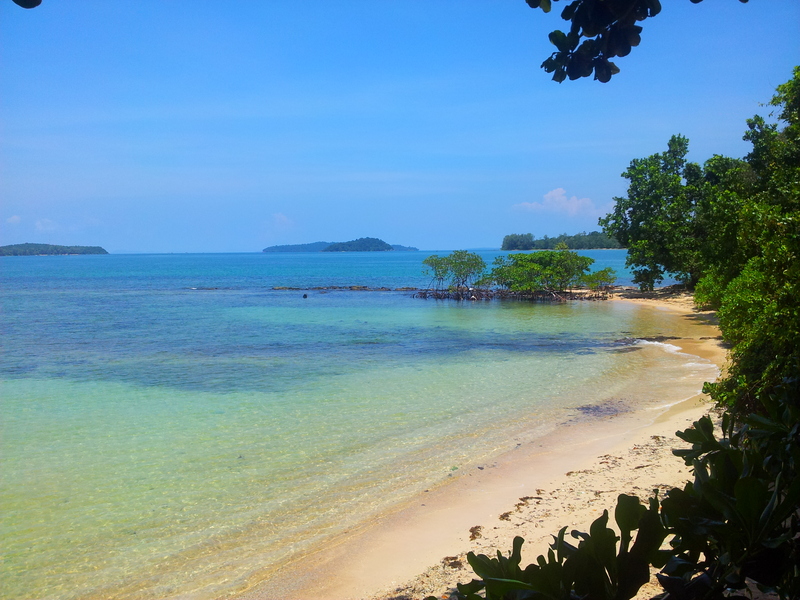 As I walk along the deserted beach (there’s literally no-one around: the island is so unspoilt! 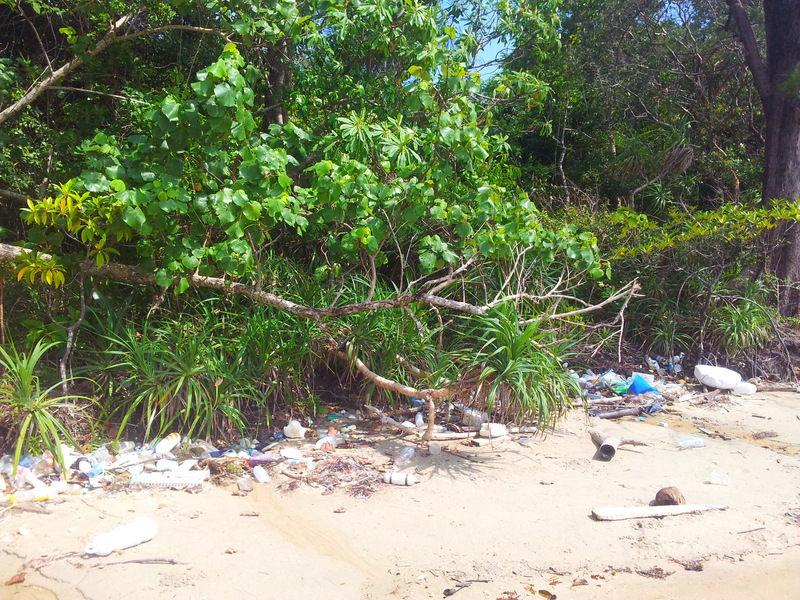 ), with thousands of crabs scurrying across the sand and rocks, I’m shocked by how much plastic washes up here. Every day, piles and piles of plastic wash ashore on an island with barely any people living on it. As humans, we’re completely disgraceful, abusing and destroying our land and our seas without a second thought. I guiltily acknowledge all of the plastic that I use and casually discard on a daily basis, knowing that it’s not biodegradable. I vow, there and then, to cut down on the plastic I buy, and to try to wean myself off of plastic completely. Inspirational plastic-free activist Beth Terry summarises on her website why plastic is so toxic, both to the oceans and sea creatures, and to our own health. 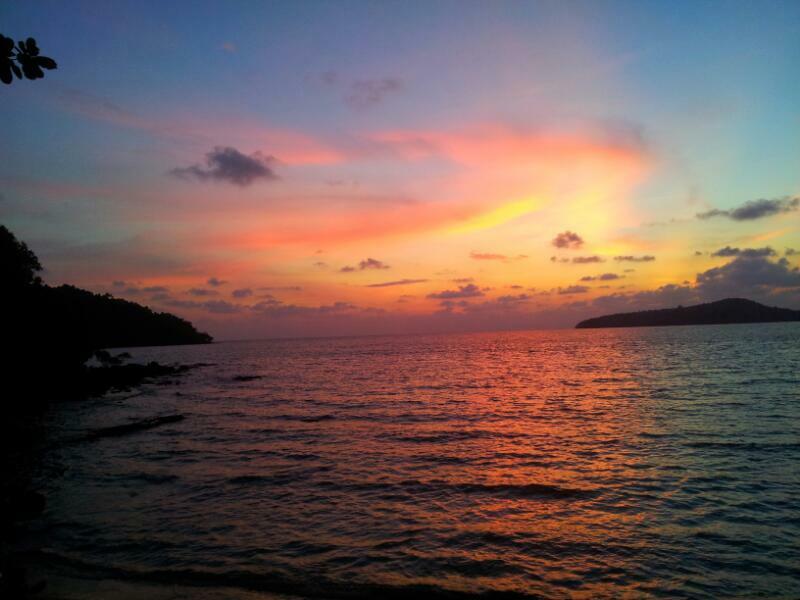 A few days later I head back to the mainland and travel to Kep, and it becomes my favourite place in the country! I really, really love this small town and the locals are so friendly. 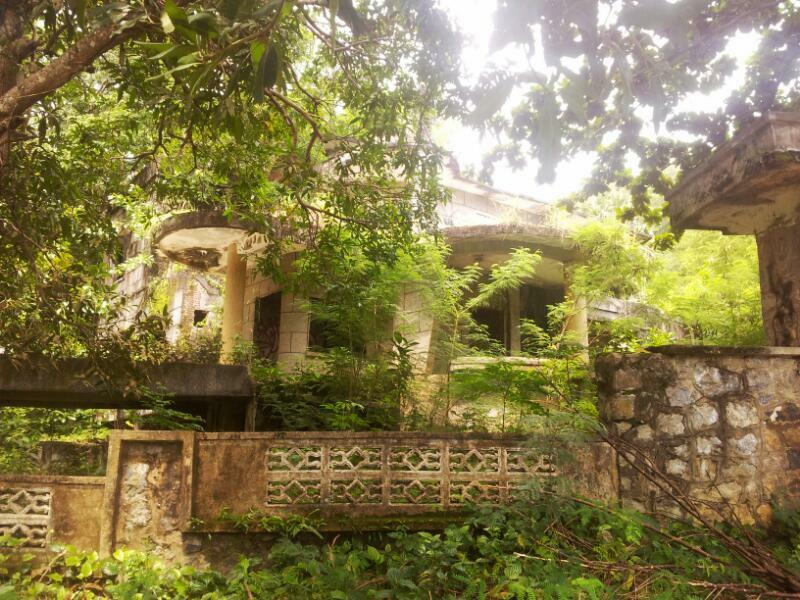 Kep’s full of delapidated French colonial villas, ruined by the Khmer Rouge, and there’s wild monkeys. 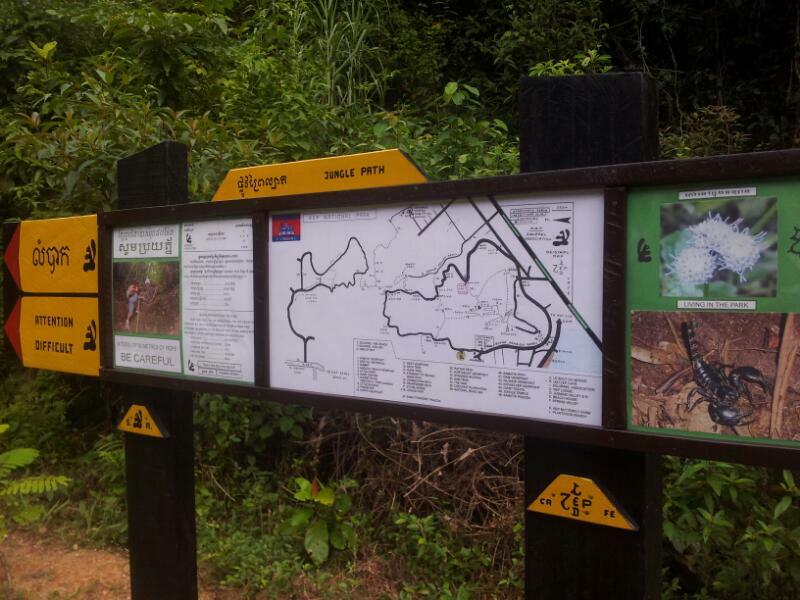 One reason why I love Kep is because there’s a MARKED HIKING TRAIL through the jungle! There’s no need for guides, and there’s no one in Kep trying to sell me a tour of the national park. And so I embark on a small, 8km trek alone. At the start of the trail there’s a warning: ‘DIFFICULT: ONLY FOR EXPERIENCED WALKERS’, mostly because you need to use ropes to haul yourself up rocks. “Fine,” I think, “I’m an experienced hiker.” There’s also a big photo of a scorpion on the warning sign. I walk happily uphill, looking out for birds and monkeys. However, within minutes I realise that there are thousands of spiders in this jungle, and hundreds of them want to cast their webs across the trail. Each web seems to be at the exact same height as my face, and I spit cobwebs out of my mouth every two or three metres. “Lucky that I’m not scared of spiders,” I think to myself. But then I stop suddenly. The biggest web ever, which reaches from the ground to my head height, stretches across the small dirt trail. Visions of Shelob from Lord Of The Rings come to my mind. I hack down the web with a stick (sorry spider, but there’s no other option!) and I walk on. One minute later I see it. For the rest of the trail, I nervously thrash a stick in the air, cutting down webs in front of me. The next day, I hitchhike with a beautiful family to the Vietnam border (they go far out of their way to take me to the border), and I’m so happy that I visited amazing Kep with its wonderful people, old mansions, monkeys and even its giant spiders.